This article was written By John Berra on 05 Apr 2019, and is filed under Reviews. Canadian-Vietnamese filmmaker Kim Nguyen latest feature The Hummingbird Project is an attempt to critique late capitalism through the travails of cousins involved in e-commerce. Or it might be trying to critique family dynamics within the framework of late capitalism. Regardless, it’s a curious film with a borderline quixotic quest – building a fiber-optic tunnel from Kansas to New Jersey to revolutionize high frequency trading – that is less interesting than the micro-level problem solving that occurs along the way. 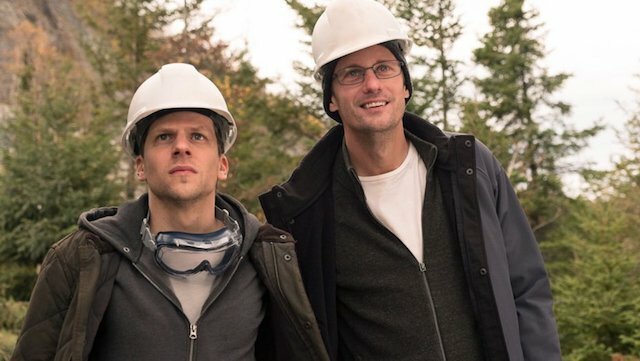 The digital entrepreneurs here are snappy front-man Vincent (Jesse Eisenberg) and anti-social computer genius Anton (Alexander Skarsgård), cousins of Russian Jewish background who work on Wall Street for demanding hedge fund titan Eva Torres (a scene-stealing Salma Hayek) but have secretly been beavering away on their own ‘get rich quick’ scheme. With backing from wealthy venture capitalist Bryan Taylor (Frank Schorpion), they aim to lay fiber-optic cable from an electronic exchange in Kansas to Wall Street’s New Jersey data bank which will save a crucial millisecond or so or so off communication time (or a single flap of a hummingbird’s wing). If operational in time, the line will make them rich beyond their wildest dreams. After recruiting reliable chief engineer Mark (an affable Michael Mando) and abruptly quitting their jobs, the cousins to be on their way, but Vincent’s project management skills will be tested by a run of setbacks. These range from gaining necessary permissions for the tunnel to go ahead (national parks, homeowners, and an Amish community must grant approval) to dealing with legal threats (Eva considers the code Anton is refining to be her property) and keeping health problems private (Vincent is concerned that revealing a recent diagnosis will derail the project). As much as the protagonists of The Hummingbird Project have the single-minded purpose that is characteristic of those who, however falsely, believe themselves to be visionaries, the film as a whole flits distractingly in tone and message. This is reflected by a soundtrack that mixes songs fitting of Nicolas Bolduc’s expansive natural cinematography (Devendra Banhart’s whimsical folk and Hope Sandoval’s hazy melancholy) with an urgent score by Belgian composer Yves Gourmeu that taps into the digital frontier. A sequence in which Anton stomps victoriously down a hotel corridor to the sound of the Beastie Boys after cracking the algorithm only to end up fleeing from FBI agents is a boisterous takedown of the precarious nature of big business, but after this showstopper, Nguyen has trouble seauging into more reflective territory. Nguyen’s screenplay is heavy on industry specific jargon (often delivered in mile a minute fashion by a typically wired Eisenberg) yet also seeks to raise existential questions. It’s more nimble when dealing with the former than the latter. Vincent’s illness-inducted epiphany and Anton’s conversation with a waitress who makes him consider the impact of his ‘pioneering’ work on the common man feel contrived so fall short of the presumably intended pathos. Still, the performances are consistently watchable with Eisenberg and Skarsgård fully committing to markedly different types. Putting a slicker veneer on his breakthrough turn as Mark Zuckerberg in The Social Network (2010), Eisenberg skillfully pitches Vincent somewhere between dreamer and hustler (Bryan clearly has concerns about which side of the line he falls on but the prospect of a crucial competitive edge keeps them at bay). The usually sculpted Skarsgård has opted for a Christian Bale-style physical transformation as the balding Anton. His hunched posture conveys much about the character even before we see signs of Asperger’s. It’s an odd dynamic that prompts recollection of another tech-orientated drama, Austin Chick’s August (2008), which concerned two brothers with markedly different skillsets trying to keep their dot.com enterprise viable amidst the volatile stock market of 2001. As with Chick’s film, The Hummingbird Project seems to be loosely derived from reports of a furiously competitive sector, in this case an attempt to install a cable that would run from Chicago to New Jersey, as chronicled in Michael Lewis’ 2014 book Flash Boys: A Wall Street Revolt. Both drop the viewer into a pressurized milieu yet rely on old-fashioned familial tension to lend wider resonance to unraveling ambitions. Nguyen’s intent is at its clearest when illustrating that what constitutes ‘revolutionary’ in the capitalist landscape will be rendered obsolete within years, if not months, while any effort to upend the system is tied to a desire to simultaneously profit from it. However, he too often gets so swept up by the delusions of the ‘visionary’ cousins that the clear-cut corporate stance of the film’s ostensible villain (Hayek’s hard-driving yet straight-forward CEO) serves as a surprisingly welcome reality check.